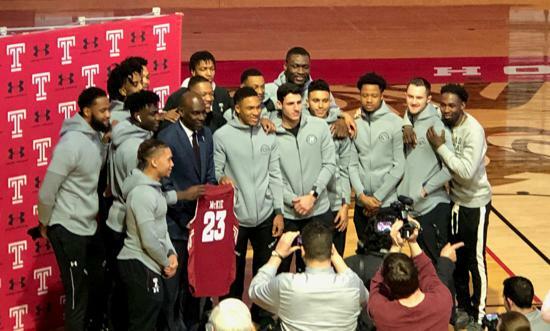 PHILADELPHIA - A new era has officially begun for the Temple men’s basketball team. 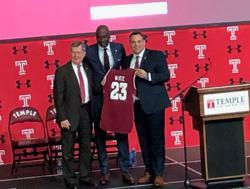 Aaron McKie, a former Temple Owl; a retired NBA player and former 76ers assistant head coach accepted the role of head coach of the Owls Tuesday at McGonigle Hall. McKie always had ties to Philadelphia basketball and he knew that one day he would return to his roots. McKie played for the Sonny Hill summer league, played high school hoops for Simon Gratz and played for the Temple Owls from 1991 to 1994, leaving behind a legacy as one of the best players in Temple basketball history. “We are delighted to have Aaron McKie as our next men’s basketball coach. Aaron knows Temple history and its rich basketball tradition that goes back for generations,” said Temple President Richard M. Englert. McKie was 17th pick to the Portland Trailblazers in the 1994 NBA Draft. In 1997, he came back to his home city to play for the Philadelphia 76ers for eight seasons. After retiring from the NBA in 2007 with the Los Angeles Lakers, he went back to the 76ers as assistant coach for five years. In 2014, McKie became a part of the coaching staff for the Temple Owls where he served for five seasons as assistant coach under Fran Dunphy. He accepted his role in front of dozens of people including the current Owls basketball team, his family and his former coaches. McKie’s spoke in gratis about the two coaches who had the biggest impact on his life. McKie attributed former Temple University and Hall of Fame head coach John Chaney and high school coach Bill Ellerbee as the greatest influences that shaped him into the man he is today. “But at the same time, they’re seeking perfection. Not just perfection in the game of basketball but in the game of life. And now, I stand before you with the opportunity that those guys had and were able to provide not only in my life but to so many others throughout North Philadelphia... And now I’ll have the opportunity to impact some kids the same way those guys impacted my life,” said McKie. McKie becomes the 18th head coach in Temple men's basketball history.